The Japanese company ALE Co., Ltd. has launched the world's first satellite built to create an artificial satellite, seen here, on a Japan Aerospace Exploration Agency Epsilon rocket on Jan. 18, 2019 JST. There's a new satellite was just launched into space, and it was put there to drop "meteors" over the city of Hiroshima. As Live Science has reported in the past, ALE, a Japanese company, has designed a system of small satellites loaded with pellets that should should glow brightly as they fall out of space, with different colors appearing as a result of different compounds burning up in the atmosphere (copper pellets would burn green; barium blue, and so on, including purple). The idea is that cities (or companies or individuals) might pay ALE big chunks of money to drop a handful of those pellets overhead, creating a sort of artificial, colorful meteor shower in the sky overhead. ALE originally planned its Hiroshima show for "mid-2019," but appears to have bumped its schedule back to spring 2020, according to AFP. 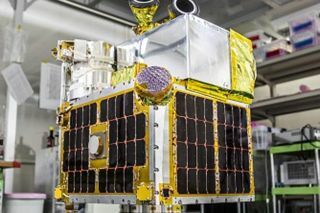 The company's first satellite hitched its ride to space aboard a Japanese Epsilon rocket that took off from Uchinoura Space Center, on the Japanese island of Kyushu, at 7:50 p.m. EST Jan. 17 (0050 GMT and 9:50 a.m. local Japan time on Jan. 18), according to Live Science sister site Space.com. Six other satellites were aboard the rocket, and all of them were released at about 310 miles (500 kilometers) above Earth. According to AFP, the ALE satellite will gradually descend to 248 miles (400 km), the altitude at which it can safely drop the pellets.